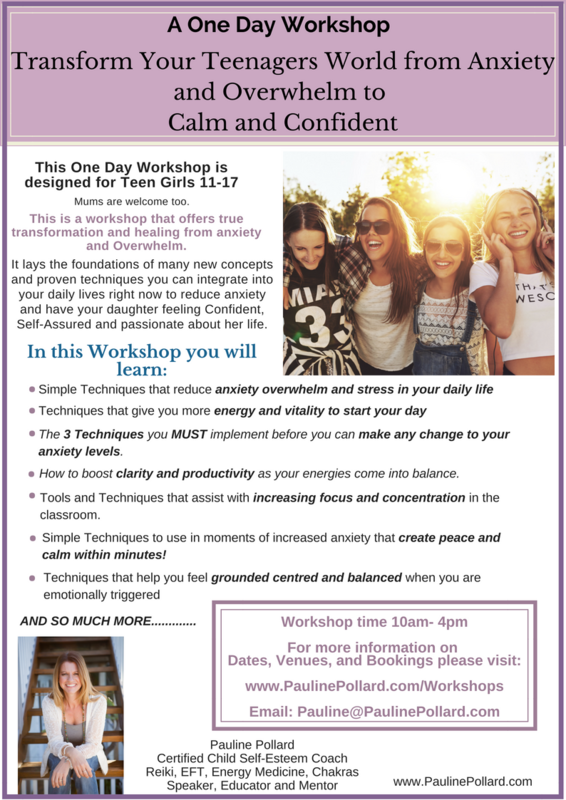 This is a workshop that offers true transformation and healing from anxiety and Overwhelm. It lays the foundations for many new concepts and proven techniques you can integrate into your lives right now to reduce anxiety and have your daughter feeling confident, self-assured and passionate about her life. In this Workshop, you will learn quick easy techniques that will not only diminish the potency of anxiety that has been blocking your brilliance - but also allow you to feel confident and empowered to step back into your power and share your talents and gifts in alignment with your truth and wisdom. * Simple techniques that reduce anxiety, overwhelm and stress in your daily life. * How energy flows through your body and how to know if your energy is blocked or out of balance. ​* How Energy Medicine works and its benefits. * How to clear the constant mind chatter and bring you more clarity. * The 3 techniques you MUST implement before you can make any changes to your anxiety levels. * Tools and techniques that assist with focus and concentration in the classroom. * Techniques to boost clarity and productivity as your energies come into balance. * Simple techniques to use in moments of increased anxiety that create peace and calm within minutes! * Techniques that help you feel grounded, centred and balanced when you are emotionally triggered. * Techniques that give you more energy and vitality to start your day. * Techniques that reduce built up tension in your nervous system and help you feel calm and connected. * How Essential Oils and Energy Medicine are a dynamic Duo! "Totally FABULOUS workshop!! EXCEEDED my Expectations!! Having fun and meeting like-minded people PLUS Learning new concepts and Energy Techniques that will have you feeling uplifted, confident and motivated! A beautifully designed course workbook of 30 pages that contains detailed lessons plus accompanying techniques detailed in a step-by-step format for you to perform at home and call your energy, power and confidence back to you once the workshop is completed. This Meditation creates an incredible connection with Divine Spirit and Mother Earth to raise your energy, feeling uplifted and confident before you walk out the door. "As soon as I met Pauline I knew I needed to work with her. She has such a special warmth about her that you know you are undoubtedly in expert hands. My child's sense of self-worth is booming and he is performing so well at school now and has learnt so many techniques to help deal with his anxiety and emotions. Pauline guided us step-by-step through many Spiritual, Energetic and Practical Strategies. I would recommend Pauline to anyone who is dealing with anxiety, self-esteem issues and problems at school. Pauline, thank you so much you are truly an inspiration." "The techniques we learnt from Pauline have not only increased our energy levels but empowered us to be motivated to try new things in a deliberate and focused way. My daughter is intuitive and loved all the energy work. She is now thriving at School and in her relationships with friends. I loved Pauline's approach in showing us how to go within to listen to the ways our bodies communicate to us. She knows her material so well and speaks with ease- it flows from her heart so you can't help but receive her message. I would recommend this Program to ALL families. I truly enjoyed the time spent with you Pauline, you are a true beacon of light to all children and Parents. I feel confident my daughter is well equipped to go on her own journey." "Before the Program my girls were emotional. frustrated and feeling overwhelmed. I am so happy to say everything has changed. My eldest daughter found School challenging and now she has so many tools and techniques at her fingertips to empower herself and feel motivated about School. It was great to learn about different Energy Techniques and how they can activate our nervous system to calm, centred and balance us. Pauline really empowered my daughters to believe in themselves and help them to see and acknowledge their self-worth. This was a priceless gift. I would definitely recommend Pauline, I am so grateful for our time together. You have definitely left a positive imprint in our lives and in our hearts. So enroll now so you don’t miss out! I WANT TO ATTEND BUT THE WORKSHOP DATE DOES NOT SUIT ME. If this date doesn't suit you then please contact me at pauline@paulinepollard.com and let me know what would suit you. If there is demand for more dates and times I will add them in! You can also purchase the Online Course if you prefer. Go to www.paulinepollard.com and click Online Courses. DO I HAVE TO COME TO THE WORKSHOP? CAN MY DAUGHTER BRING A FRIEND? If you are unable to come to the workshop I totally understand. Your daughter is more than welcome to bring a girlfriend regardless of whether you attend or not. The cost per person is $150.00. There are limited spaces for this workshop so we are unable to offer refunds however, you may transfer your ticket. As an educator I have the ability to drill down the information that is focused and clear that gets you results. In my workshops it is not just watch and listen program – it is an implementation program. The transformations happen in the action steps and practicing the simple and effective techniques for long term change. The Program has been developed for ages 11 -17 years and Parents. Once you attend this workshop you will understand that everything I teach is applicable for everyone no matter what stage you are in life. All Parents wish they had learnt this information and techniques when they were younger! Your teenagers will embrace the information and techniques in this workshop. These are skills and techniques that will benefit them throughout their entire lives. I AM NOT SURE IF THIS IS THE RIGHT TIME? Our children grow up so fast, and you only have so many years to positively influence them. Why keep “wishing and hoping” that things could be better when you can start supporting your child NOW with positive tools and strategies you can use immediately. Once you know these tools and strategies, they are with you forever! This Workshop is an investment in your child’s well-being. When you consider all the other items you buy for your child, I believe this is one of those items you know is essential. Don’t waste another 6 months or a year trying to figure out how to best support your child on your own. Get the guidance and support you need now so both of you can learn the skills, and techniques that will stay with you and your child for a lifetime.